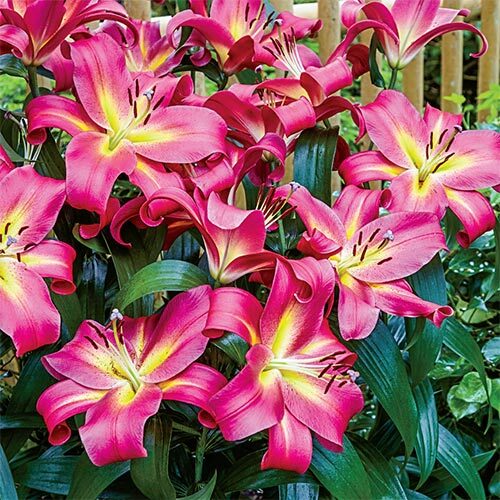 A recently introduced Giant Hybrid Lily, Empoli has red-pink to dark pink, large 8" flowers with golden-yellow, star-shaped centers. With up to ten flowers per sturdy stem on an established plant, these fragrant flowers are perfect for the back of the border, cut flower arrangements and bouquets. Leave fully hardy bulbs in the ground in order to grow taller flowers each year—3-4' the first year and 5-6' the second year with an ultimate height of no less than 6' after 3 years! Allow foliage to die back naturally so that the bulb can build up energy for next year. This is the hybridizer's perfect cross between the exotic Orientals and regal trumpet lilies. 16-18 cm bulbs.